India Yamaha Motor Pvt. 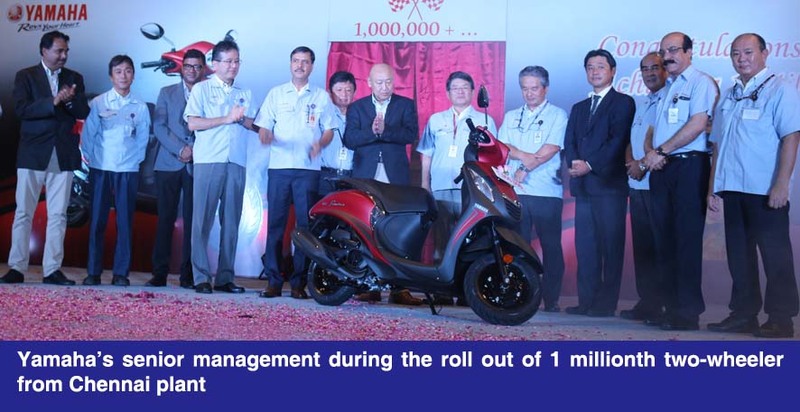 Ltd. (IYM), one of the leading two-wheeler manufacturers in the country, reached a major milestone of producing its one-millionth unit from the Chennai factory on September 22. The one millionth model rolled out of the IYM’s Chennai factory is India’s most stylish scooter, Fascino. The other scooter and motorcycle models which contributed in reaching this landmark by IYM includes Ray Z, Ray ZR, Alpha, Saluto and Saluto RX. Yamaha began its operation in Chennai in March 2015 with an initial capacity of 4.5 lakhs unit per annum. In a short span of two years, it increased its capacity to 6 lakhs unit per annum and by 2019, it will reach at 9 lakhs unit per annum. The increase in production figures can largely be attributed to the increasing popularity of scooter and motorcycle brands of Yamaha in India. The total production capacity of IYM including the factories in Chennai and Surajpur by 2019 will reach at 1.6 million units per annum. Out of one million products manufactured from the Chennai factory, 8.5 lakhs units have been manufactured for the domestic market and remaining 1.5 lakhs units for the export market. Fascino is the most produced product with 3.7 lakhs units. The production percentage ratio of the scooter & motorcycle production at the factory is 7:3 right now. The models with highest export numbers were the FZ series, Ray ZR and Fascino. Yamaha has so far invested Rs. 1,300 crores in the Chennai factory and plans to invest more than Rs. 200 crores by 2018. Chennai factory is the first in the Yamaha Motor Group which has a “Vendor Park” in its nearby vicinity. The vendor park has 9 vendors which have invested Rs. 760 crores till date, employing more than 1,900 people. The facility has supported in bringing together the production operations of main external parts suppliers, thus enabling complete synchronization of external supplier parts production as well. This system helps reduce losses in the areas of production management and distribution to extremely low levels in the overall engineering and manufacturing process, and thus making the production base a highly-efficient and profitable plant. IYM’s Chennai plant is an energy-recycling factory that is friendly to people and the global environment. The plant incorporates state-of-the-art infrastructure and advanced technologies for Zero-water discharge and recycle/reuse of waste water and maximum use of sunlight. The building is compatible to solar power system installation. All common utilities are located in the centre to minimize distribution loss & centralized management.